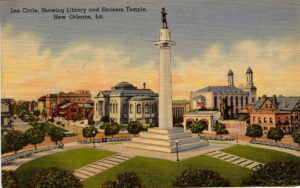 (Quin Hillyer, Liberty Headlines) As the national networks take brief note of the climactic days of the long running dispute in New Orleans about the city removing four “Confederate monuments” from public streets, the Louisiana media is running frequent updates, with banner coverage, of every development. Confederate monuments: Where will they go next? Mayor Mitch Landrieu, the driving force behind the statues’ removal, is aggressively seeking national media attention to explain the removal, doing nothing to dissuade people from the idea that he actually may run for President in 2020. Landrieu talks a game of reconciliation – writing in the Washington Post that “after” the removal of the statues, then he would advocate “coming together to decide who we are as a city – and as a nation.” But Landrieu has come under fire for not fomenting a constructive conversation about the monuments, before their removal, but instead twisting arms to force the matter to a City Council vote guaranteed to produce Landrieu’s desired outcome. This is what we have been reduced to. You either support removing the statues of Robert E. Lee, P.G.T. Beauregard, and Jefferson Davis or you are a white supremacist. That is a mistake and a long-term detriment to the reconciliation and healing we need to go forward as a community. I know many people of goodwill who have opposed the removal of the monuments, who have felt left out by the political process and are irked by the way they are being portrayed. They are neither extreme nor violent. They respect the rule of law. Lost in the shuffle, or at least in the mayor’s statements condemning the monuments and the national media coverage of them, are almost all attempts to consider each monument on its own merits rather than as a group….